•The Little Tokyo/Arts District Station three-month closure begins Friday at 9 p.m. to accommodate Regional Connector construction. Details here. •ICYMI: Video rendering of new pedestrian tunnel between 7th/Metro Center Station and the Bloc in DTLA is here. •There’s still time to take Metro’s new online parking survey. For the Spanish version, click here. A rendering of the proposed Chargers/Raiders stadium in Carson. Attentive viewers may notice that one side of the stadium appears to have seats while the other half appears dedicated largely to luxury suites. Hmm. It’s a slow day transportation news-wise, so let’s turn our attention to a quasi-transpo story: the prospect of an NFL team or teams relocating to an eventual new stadium that is close to the oft-constipated 405 but not close to rail transit. Attentive readers know the story: the Chargers and Raiders want to go to a shared new stadium in Carson, the Rams want a new stadium in Inglewood on the site of the old Hollywood Park racetrack. Of the two sites, the Hollywood Park is closer to a rail line — well, future rail line — and would be about a 1.8-mile walk or shuttle bus ride from the Crenshaw/LAX Line’s Downtown Inglewood Station. Yes, there are bus lines near both new stadiums, but let’s face it — trains have more capacity than buses and don’t get stuck in traffic. •Parcels for new football stadiums aren’t easy to come by in So Cal, so it’s not shocking that the parcels chosen by the Chargers, Raiders and Rams don’t happen to be near transit — and it’s hard to blame Carson and Inglewood for wanting a team(s) and a future Super Bowl(s). That said, I’m a little surprised that in a region that is growing its rail network so little attention has been paid as to whether a new stadium is near rail transit, given our region’s chronic traffic anxieties. There was one exception: the DTLA stadium at L.A. Live that would have been a short walk from Metro’s light rail and subway systems. That proposal fizzled partly because it didn’t come from an NFL owner. If Davis and the NFL pause for a moment, they should realize how much they already have here: Incredibly loyal fans. An affluent region with a strong economy. An already approved development plan that includes environmental clearances. A stadium site with excellent public transit, freeway and airport access. •Finally, I personally don’t know anyone dying to have an NFL team here although I can see why the NFL thinks the L.A. metro area has enough people to fill a stadium (although UCLA and USC don’t always fill their games to capacity). The fact that the NFL wants to be here is a reflection of the fact that our region — warts and all — is an economic powerhouse with a lot of companies and industries the NFL would surely like to share sleeping arrangements with. At least it appears that if a team is relocated here, the Expo Line-adjacent L.A. Memorial Coliseum is a strong candidate to host games for a few seasons. If that’s the case, take our poll please…. One possible measure on the November ballot in the city of Los Angeles would “impose a moratorium of up to two years for real estate projects that require an increase in the allowable density,” according to the LAT. But Mayor Eric Garcetti says that could get in the way of building more housing, including affordable housing — an assessment ballot proponents disagree with. This just goes to show (again) how hard it remains to build in Los Angeles because of concerns over density, traffic and parking. As we mentioned yesterday, attempts to update community plans in L.A. have largely been incomplete although the completed Hollywood plan was successfully challenged in court and tossed out. In theory, expanding our transit system in L.A. County — five rail projects are underway and more are to come under Measure R — should appease some concerns about density. But that doesn’t seem to be entirely the case. Your thoughts, readers? Cities, cities, cities! Check out the maps, created using data from NASA. Things to read whilst transiting: On the subject of pro football, remember Packers coach Mike Sherman? He’s now coaching high school in Cape Cod. Good story on the MMQB. Things to read whilst transiting 2: Two stories about Star Wars on the New Yorker’s website and they are both worth reading: 1) What the seven Star Wars films reveal about George Lucas; 2) The George Awakens. Things to read whilst transiting 3: 50 wonderful things from 2015, a nice list on the NPR Monkey See blog by Linda Holmes (who hosts the entertaining Pop Culture Happy Hour podcast each week). I was pleased to see the Judge John Hodgman podcast make the list. Attentive Source readers know — and this is a brag, as the Judge would say — that my case was on JJHO last year and there are more than a few milk-out-the-nose moments. Dec. 21: Silver Line to San Pedro. Both locations are fairly close, but not close enough. The Inglewood is in the middle of transit but will be in the center of this little horse shoe once Crenshaw is done. We will have Hawthorne Lennox Station to the South west, Crenshaw Station to the East, Century to the West, and Downtown Inglewood. Of all of these options, I’m exiting Crenshaw Station, hopping a 210 or 710, exiting century, and making the walk. Today that would be the easiest and most reliable. Prairie Blvd is an interesting Blvd with very little bus service. One might go to Haw throne Lennox station also, catch a 40 to Century, and make the walk. Its too bad the Green and Crenshaw come so close. It would suit the teams owners to pick up their fans. If I owned a team, i’d work with metro to get my fans to support my team. Not only does it show an appreciation for the fans, but the city of Los Angeles as a whole. Its a great way to one up the other teams. Like Stadium building in the UK. I think that the walk from the Downtown Inglewood station would not be bad at all. A mile talks about 10 minutes to walk. If market is turned into a pedestrian plaza it could make for a great gateway through downtown and then (unfortunately) down a residential street toward the stadium site. NFL home game as are only held 8 times a year so I do not think the traffic impacts would be too wild, all things being constant. Good points, And I hadn’t really imagined Market Street, but after you mention it it makes perfect sense. That residential area is what creates a gap just like you said. I’d hope more than just 8 NFL games would be played, but that being said. A non playoff contender wouldn’t have many fans attend attend anyway. I don’t recall many Clipper Traffic Jams way back hahahahaha. A mile most certainly does not take 10 minutes to walk. Typical walking speeds are 3-4 mph, so expect it to take 15-20 minutes. Once you add in urban issues like crosswalks, red lights, etc., you’re easily looking at 25, possibly 30 minutes if you hit every red. I’d still personally do it, but most people won’t. I love trains and all but rode the 312 from Expo line to The Forum last week to see Dead and Company and worked out swimmingly. Dropped right on the corner, saved $25 in parking and of course, didn’t endanger anyone on the roads. If the nearest train to the Inglewood stadium was 1.8 miles away I’d ride the bus instead. If only there was a hub nearby the way Union Station shuttles serve Dodger Stadium free for ticket holders. Because the three teams have not chosen a site near light rail or heavy rail is their decision based on economics. Concerning Inglewood, why not build a spur to the stadium? It was done for the L.A. Coliseum prior to the old MTA days. In fact there was special bus service to the Olympic Auditorium where boxing, wrestling, and Roller Derby took place. Even under the RTD special service was provided to Hollywood Park, Santa Anita and Los Alamitos Race Tracks which history shows they were previously serviced by special rail service. What is needed in Los Angeles is more rail provided where people travel instead of where land is the cheapest. Football is entirely too much fuss over a lousy 25 cents (you know: they start with a coin toss, then spend the rest of the game trying to GET THE QUARTER BACK). The teams should pay for an APM from the stadium site to the nearest light rail station. I read a study (published here I think) that a person in Los Angeles is only willing to walk a quarter mile or about 10 minutes (A mile is about a 30 minute walk contrary to what is discussed above). Realistically, a team should have no trouble getting a loan to finance a small spur to pay back over lets say 15 years. It wouldnt really have to put people on the doorstep of the Stadium, but at least as close as Staples or the Coliseum. 30 minutes for a mile is closer to crawling. A non-disabled human can easily walk a mile in 20 minutes or less. As far as some team building a billion dollar people mover that will cost almost as much as the stadium itself, it simply isn’t going to happen. Why on earth do people think this would be realistic and what examples are they basing this off? Best that could be done is something similar to a Dodger Stadium Express. There are plenty of stadiums around the world that have proper access to Public Transportation. With public transportation, I usually see opportunity. Negativity gets nothing built. I lived in the area when the Lakers and Clippers still played at the Forum, and guess what? Even non fans would support a proper connection. Last I checked, the people that live near Dodger Stadium hate the situation, and fans alike think it should be improved. I’m basing my ideas off of experience, optimism, and looking at how other large stadiums around the world get fans to the games. Nay saying is why Los Angeles looks the way it does today. Lets use our imaginations this time around. Brainstorming is fun. I’d go to any of the three and Go Metro when I’m not planning on tailgating with my custom LA team smoker grill! Being a transplant from Michigan, I miss the annual opportunity to attend training camps, community events, tailgates and game days. Its always funny that the narrative about Los Angeles is that we don’t care – that’s ridiculous! The Angel’s and Dodgers are in the top five of MLB in terms of attendance and the Lakers and Clippers are as well. Silver Line to Carson or Crenshaw/LAX to Hollywood Park would be NICETY! Could the airport connection spur extend eastward towards a potential ingle wood stadium? All a two year building moratorium on projects that go over the allowable density would do is make the huge projects get built a few years down the road. Seems to me more like a way to bring people to the table than a real solution to anything. I think the mayor is right to have a conversation with the moratorium’s backers, because it could result in a conversation that would bring change to the real culprit: the current zoning code, which is outdated, overly restrictive and inflexible. It is starting to become obvious that the politicians like it this way, so that they can grant exceptions to developers who have done them favors. Overall, Carson is the better choice in my opinion due to proximity to Orange County and Palos Verdes. The attraction of Inglewood to be near the airport and Westside is overrated in my opinion, plus Inglewood’s mayor acts tyrannical to his citizens, as witnessed by that recent lawsuit over a citizen reposting Inglewood City Council meetings with commentary which the City just lost. A Carson stadium could easily use Express Lanes Toll Grant money since it is within three miles of the Express Lanes, and toll money could help subsidize Silver Line service direct to the stadium. 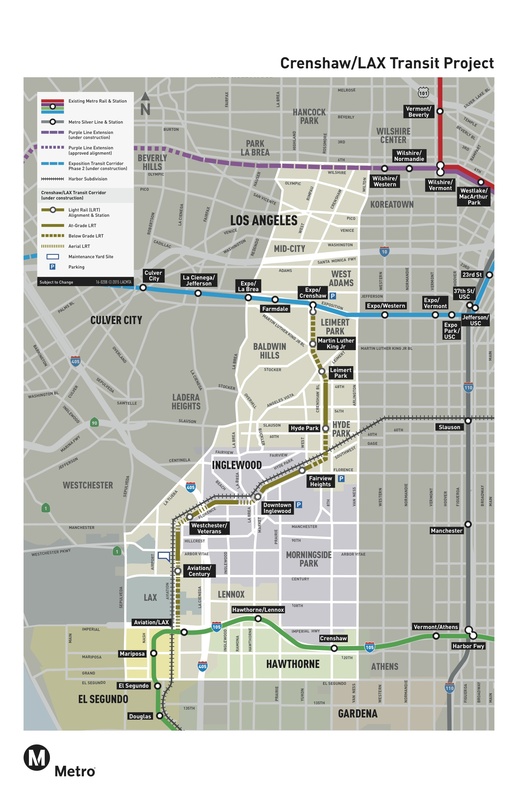 Since Metro insists on treating the Silver Line like rail on the map (even though service to San Pedro is every 30-40 minutes most of the day), adding a Silver Line stop close to the stadium would help increase its attractiveness. Inglewood is appealing to me (I can only speak for myself) since its got existing stations within a mile or two, and more coming. I’d never seen the South Bay/ Harbor Area plans before. Those look awesome! To be honest, i’d visit more Galaxy matches if it didn’t take the duration of a match to get there. They are the 5 time Champs. “adding a Silver Line stop close to the stadium would help increase its attractiveness”, and is easier than building a new line and is not too far out of its general route. Riding Metro to the games sure beats driving drunk. 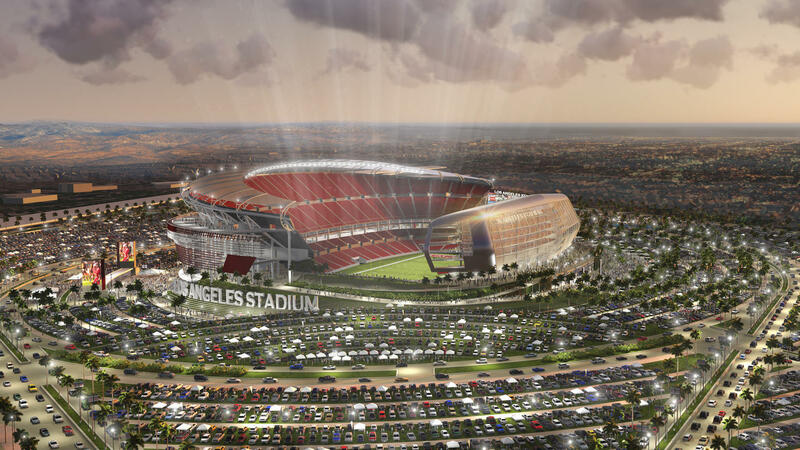 What bus lines will Metro reroute to the Carson Stadium? I think if Inglewood wins, the City should build a streetcar line from Green Line Metro Stations to the Stadium or proved bus service to and from the Stadium. The issue for me remains that taking metro simply isn’t worth it and ends up taking significantly more time than driving. Take for instance current events at Staples Centers like Clippers, Lakers and Kings games. Metro advertises to take public transit to Staples Center, however trains run at 20 minute intervals, leaving many riders waiting too long to justify public transit. If the same problem continues with a football team, driving will definitely be a preferred method. If “Half the world’s population lives on just one percent of its land”, then the other half lives on the other 99% of the land.